Core apples using a melon baller leaving the bottom of apple so they hold the stuffing. Combine lemon juice and water and place apples in it as you complete coring them. Mix honey, raisins, walnuts and cinnamon together and fill cavity of apples. 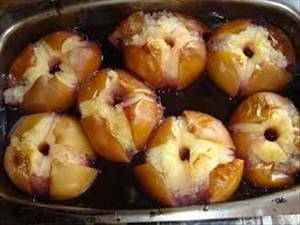 Place apples in a baking dish with about 1 cup of the lemon water in the bottom of the dish. Bake uncovered for about 50-60 minutes depending on size of apples until they are tender. Drizzle juice from bottom of pan over apples and serve hot. There are 356 calories in 1 serving of Stuffed Baked Apples. Calorie Breakdown: 23% fat, 73% carbs, 3% prot.